The Danville Art League (DAL) is holding its annual fall juried exhibition, Fall’s Back, at the Danville Museum of Fine Arts and History beginning October 29, 2017. This fall’s event is one of DAL’s two major exhibitions each year; and is open to all artists. Historically, professional artists and faculty from throughout the region participate, including Lynchburg, Central and Southside Virginia and North Carolina amateur and professional artists. The year’s exhibition is similarly expected to draw participants from throughout those same locales and beyond. The Show prospectus is sent to all arts organizations in the region. Whether a beginner or professional, DAL encourages everyone to enter. The DAL is pleased to announce the continuation of the categories of photography/digital photography and 3-D (sculpture, jewelry, pottery, mixed media, metal work, et al), accompanying the painting category. Cash prizes and ribbons will be awarded pending the number of artists in those categories. 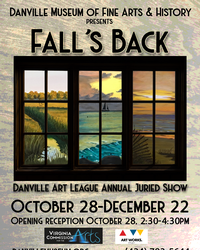 The public is invited to join DAL members and participating artists at the opening reception for Fall’s Back at the Danville Museum of Fine Arts and History located at 975 Main Street in Danville, Virginia on Sunday, October 28, 2018, from 2:30 to 4:30 pm. This is a wonderful opportunity to see the show which includes paintings in oils, acrylics and watercolor, as well as photography/digital photography, graphite and charcoal drawings, ceramics, sculpture, jewelry and more. The exhibit will be an exciting mix of traditional and innovative techniques and expression. Award winners will be announced at the reception. Those interested receiving a show prospectus or sponsoring the exhibition should contact Exhibition Chairman Jim Jennings at 434-489-1179 or email jjennings64@gmail.com. DAL is honored to announce this year’s judge is Eva Palmer. Palmer grew up in Danville, VA. She was graduated from George Washington High School and Averett College. She earned a Bachelor of Science Degree in Education with a concentration in art from Old Dominion University and Master of Arts and Master of Fine Arts Degrees from James Madison University. Palmer is a former Professor at Liberty University teaching Drawing, Painting, Design, Aesthetics, Art and has many honors in the realm of the arts. She speaks widely in both domestic and international art conferences, most recently in Rome, London, Paris and Los Angeles and has numerous publications to her credit. She is an accomplished painter and sculptor whose works have been entered in national juried shows and is also is sought as a judge and critic for exhibitions. The Danville Museum of Fine Arts and History has been a long-time supporter of DAL. In fact, it has supported DAL since 1980. That was the year a group of local artists gathered together and created this organization to support the arts and the local artists in the community and throughout the region. Throughout the years DAL has provided opportunities for local artists to display their works, learn new techniques, and to promote visual art. DAL now has over 70 members and is always welcoming new artists. DAL invites artists of all ages and genres to join, along with those who support the arts or those who just want to learn more about the arts. To join the Danville Art League, or for more information, find us on Facebook or inquire at DAL, P.O. Box 10202, Danville, VA 24541. You can also call the Danville Museum of Fine Arts and History at, 434- 793-5644 or stop by at 975 Main Street in Danville to pick up a brochure. The Danville Art League, Inc. wishes to recognize the sponsorship of the Virginia Commission for the Arts as well as the assistance and cooperation of the Danville Museum of Fine Arts and History for providing facilities for the reception and this exhibition.